A code violation exists when some element in the construction of the home violates the code standards. In older homes this can be the case if a home, which may have originally been built up to code, has not been updated and now some structural elements are out of date. 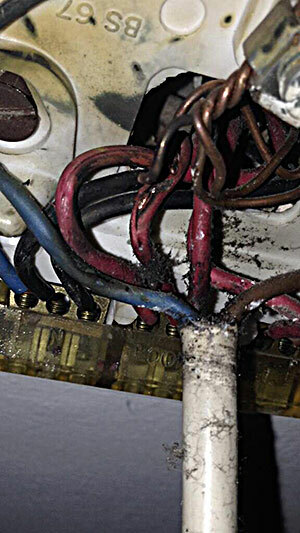 The State of Florida and its municipalities take electrical code violation seriously. They therefore expend a lot of effort to identify residential and commercial electrical code violators. Getting their attention is not in your best interest. If you are issued an electrical code violation citation, respond quickly. Once an electrical code violations is issued there is a set time that a property owner has to hire a licensed electrical contractor. He then has to open the proper permits, perform the corrective work and have the work inspected by the county’s inspectors. Not doing so in a timely manner can results in fines being imposed or liens being placed on the property. Perform an in depth violation search on your property. Inspect your entire electrical system. Advise what you need to correct in your present electrical system. Open needed permits with the proper municipality. Complete all corrections and document the results. And warranty your installations for 1 full year. Identify & Label Circuits in Panel Box. Properly Bond or Ground Electrical Equipment. Insulate, Replace or Moving Exposed Wires. Identify and Fix Reverse Polarity Circuits. Adding More Circuits or AC Sockets. Dedicate Circuits for Specific Equipment. Install Covered Residual-current Devices in Outdoor Areas. Eliminate Excessive Extension Cord Usage. In Martin County, Goodiel Electric, LLC. provides Electrical Code Violation Correction services to Indiantown, Jensen Beach, Jupiter Island, North River Shores, Ocean Breeze Park, Palm City, Port Salerno, Rio, Sewall’s Point and Stuart.